The globular, dark red roots with unique white rings make this Italian-named variety tender and delicious and they can be utilized fresh, canned or pickled. Their reddish green leaves also make good-tasting greens. These heirloom beets are easy to grow and tolerate a wide range of conditions but prefer cool weather. Heirloom Chioggia Beets have round, dark red roots with unique white rings that make this Italian-named variety tender and delicious and they can be utilized fresh, canned or pickled. Their reddish green leaves also make good-tasting greens. These heirloom beets are easy to grow and tolerate a wide range of conditions but prefer cool weather. 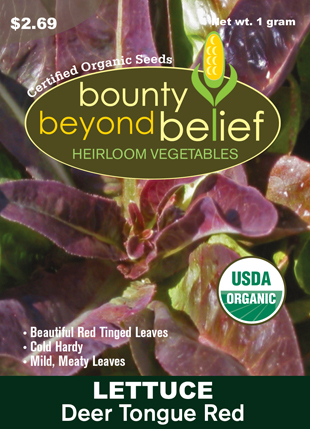 Beets are easy to grow and tolerate a wide range of conditions but prefer cool weather. If you want sweeter beets, plant them early and harvest when young before they fully develop the earthy flavor from the organic compound goesmin. Soak the seed for 24 hours and plant in shallow saucers for winter microgreens and harvest by snipping off tender young shoots close to the soil with scissors to get the colorful stems, too. The young shoots are colorful and are tender and sweet. Beets add minerals to the soil and their leaves are composed of magnesium that is an excellent addition to your compost pile. Plant your beets with lettuce, onions and brassica (mustard family). Planting garlic and mint with your beets will improve the growth and flavor.